from the Ground Up” and I’ll be speaking on the Power of The Blog. I’m speaking today in Chicago at the "Get a Life" Conference put on by Total Attorneys. I’ll be in Phoenix tomorrow presenting to the Southwest Chapter of the Legal Marketing Association (LMA) on the use of social media, including blogging, for law firms. Thanks again for having me present Friday afternoon to the 19 lawyers selected for their potential for leadership at the LeadershipSBOT. It was truly an honor. 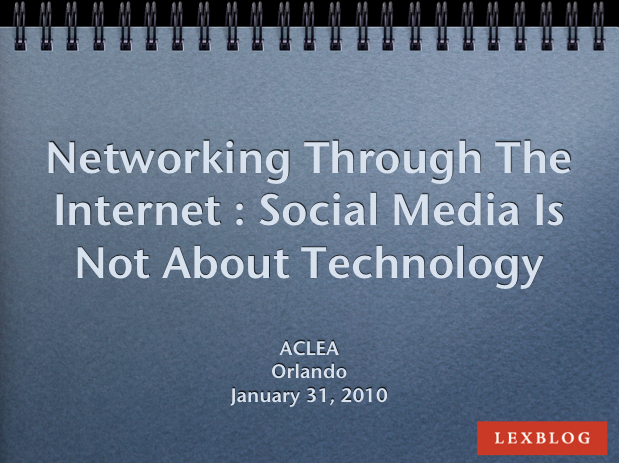 My presentation was on online thought leadership and reputation management, primarily covering blogs, LinkedIn, and Twitter. As promised for attendees, here’s my PowerPoint for viewing. For Seattle lawyers and law firms, I’ll be doing a luncheon presentation for the Legal Marketing Association Northwest Chapter this Thursday July 24. Please sign up if interested. Here’s a copy of my presentation at the Texas State Bar Annual Meeting this morning. Click here to download PowerPoint presentation. I’m traveling to Houston and Los Angeles the end of this week. As always, I would welcome getting together with anyone. Thursday, I’m in in Houston for the Texas State Bar’s Annual Conference. It’s at the George Brown Convention Center.